Latest news: 24 November 2016. Growing evidence is emerging of the real-world impact of research using the 45 and Up Study, with findings influencing tobacco legislation, helping to fill evidence gaps on chronic disease management, and being cited as central to driving greater use of linked data research. Study director Professor Emily Banks has outlined how her team’s research showing the true health impact of smoking – which revealed two in every three Australians who currently smoke will die from their habit if they don’t quit – was among the core justification used by government to increase the excise on tobacco. Professor Banks says tobacco divestment campaigners including Dr Bronwyn King had also used the findings in advocacy and smoking cessation organisations such as the Quitline was using the findings successfully in their front line services. A report from the Australian Institute of Health and Welfare highlighted the Study’s value in researching chronic diseases. It used data from the Study linked to MBS and PBS data, to look at the use of lung function testing in chronic airways disease. And it found that contrary to recommended guidelines, most study participants who were prescribed new medications for chronic airways disease did not have lung function testing before of after their initial prescription. The report says the findings will help inform strategies to improve appropriate prescribing and health outcomes for people with chronic airways disease, and demonstrates how research using linkage to cohort data like the 45 and Up Study “could provide valuable evidence for health policy and the quality use of medicines”. It says that with suitable linkage keys, similar methods could be used to explore anonymised linked data on a national level, as well as fill evidence gaps associated with other high-burden chronic diseases such as diabetes, cardiovascular disease, arthritis and cancer. The 45 and Up Study has also been cited as a factor in NSW being one of two states leading the way in using linked hospital data for research. A systematic review of Australian studies using linked hospital data found that more than 80% of publications over the past two decades were from NSW and Western Australia, while other states lagged behind. “Much of the increased research appears to have been driven by the additional datasets that enhance the use of linked hospital data, including the development of a large cohort through the 45 and Up study and NSW Perintal Data Collection,” the paper says. Policy-relevant research using the Study received a further boost in October, when a research project led by the University of Sydney’s Dr Melody Ding was awarded a 2016 NSW Cardiovascular Research Network Collaborative grant worth $200,000, for a project that will explore the effects of the built and social environment on cardiovascular health outcomes. 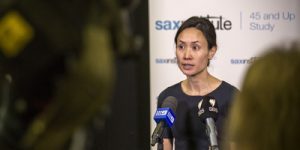 Dr Ding says the project will use data from the 45 and Up Study, together with linked datasets, and aimed to build stronger evidence towards understanding both the causal nature of exposure to the physical and social environment and CVD, as well as mechanisms through which environments affect health outcomes.